A video of Boko Haram insurgents celebrating Sallah in Sambisa forest has surfaced online. In the five minutes, 17 seconds video, the insurgents held prayers with guards wielding rifles. 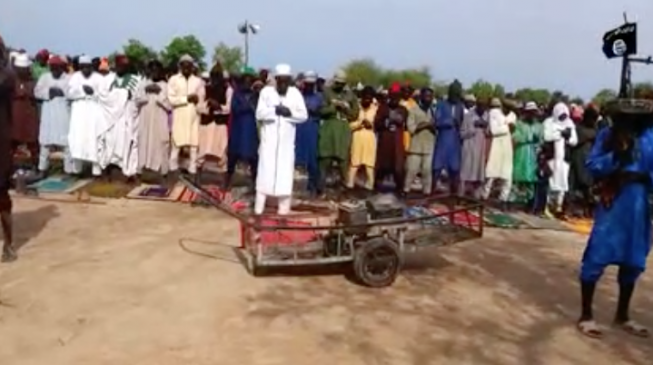 The clip was released two days after 20 persons, including children, were killed by suicide bombers in an attack in Damboa local government area of Borno state. The federal government has continuously claimed that the Boko Haram sect has been decimated. But in the clip which surfaced on Monday, three insurgents were heard thanking their God for a successful Ramadan. One of the insurgents was heard saying that God is more than any individual. “We are the member of the jihad and our leader is Abu Mohammad… Abubakar Ishak – We thank Allah for the fasting and for all our brothers out there,” he said. “Infidels are in trouble. Thank Allah the fasting is over and Allah pass everybody,” another insurgent said. We want the world to know that we are alive and happy to witnessed the festive occasion. Different efforts to put the group in check have not yielded the desired result, though the current administration has succeeded in limiting the attacks of the sect.